It’s easy to dismiss pumpkin ale. First of all, there’s the ruined expectation: they don’t taste like pumpkin. That complaint I can’t really understand. Who wants to bite into plain pumpkin, anyway? Squirrels? Then there are the drinkers for whom the style is too intense. “Yuck,” they say. “It tastes like I just sucked on a cinnamon stick.” That complaint I can get with. Who wants their mouth covered in spice? Squirrels? Pumpkin in beer goes back to colonial times, when they used it for fermentation. A lot of today’s professional brewers – and even some homebrewers — have a masterful touch and test batch control, and they’re able to play with just how pumpkinny, verses spicy, they want their product to be. 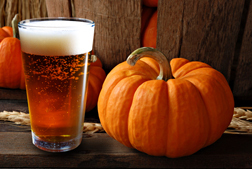 Pumpkin beers are often built around a style, like brown ale or pale ale, with pumpkin or pumpkin puree added early in the brewing process. Most of the flavor, however, comes from spices you’d find in pumpkin pie, like nutmeg, cloves or ginger. What casual pumpkineers might not realize is that these spice/herb/vegetable-style beers come in a variety of intensities. I’ll break them down for you and review some representatives of the style. Sometimes you’re just in the mood for that light pumpkin taste, and depending on what you’re eating, just that little bit that won’t overwhelm your palate. I tried Long Trail Brewing’s Pumpkin Ale and found it to be very mild. Like any good Halloween costume, this one disguised the mellow taste by having a spicy nose and being bright amber. The taste was also short-lasting and thin, but instead of leaving me with a whole lot of bitterness or sweetness, I really wasn’t left with anything at all in the finish. This is not necessary a bad thing; there are times when I just want to quench my thirst. However, if I wanted to do that, I probably wouldn’t reach for a pumpkin beer. I’d reach for water. Other mild pumpkins include Saranac’s Pumpkin Ale, Wolaver’s Will Stevens Pumpkin Ale or Smuttynose Pumpkin Ale. There are other times when you’d like either a dash of spicy taste or even that vegetable background that reminds you that despite global warming, it’s actually autumn. Dogfish Head Brewing is known for its experimental (Chateau Jiahu, with brown rice syrup and intense (120 Minute IPA, which is about 20 percent alcohol by volume) beers. Oddly enough, its Punkin Ale, is not so punk. It’s 7 percent alcohol by volume, but that boldness doesn’t come through in the taste as much as you’d think. Instead you get a crisp shot of brown sugar with residual cinnamon notes. It’s at this level of intensity that you’ll want to try pairing with food. Of course pumpkin pie should match, but oatmeal or ginger snap cookies work, as well as vanilla ice cream. Other medium pumpkins include Brooklyn Brewery’s Post Road Pumpkin Ale, Shipyard Brewing Pumpkin Head Ale or Samuel Adams Harvest Pumpkin Ale. If you want a more muscular pumpkin ale, it won’t be that difficult. The American craft brew race for bigger and bigger definitely has crossed over to the pumpkin world. Anything that says “imperial” in the title is going to be a “big” beer: more alcohol, more complex taste, more, more , more. Weyerbacher’s Imperial Pumpkin starts out with the pour as being a very different beer than the Long Trail and Dogfish Head. It’s a darker amber, almost brown. Everything’s more intense: it’s spicier, the taste lingers longer on the tongue and it’s a bit creamier, too. There’s cardamom in there, and if I hadn’t recently had a homebrewed Belgian wit with that spice, I wouldn’t have recognized it. The Imperial Pumpkin is also balance: a caramel flavor from the malt gives it a sinful sweetness. If you enjoy bigger pumpkins, you might also consider Southern Tier Pumking or Long Trail Imperial Pumpkin Ale. On Oct. 26 in New Haven, you can participate in Bikes & Beers Halloween Edition, a bicycle ride organized by CT Beer Trail, Devil’s Gear Bike Shop and O’Toole’s Irish Pub and Restaurant. After meeting on the New Haven Green at 5:30 p.m., the casual ride will kick off at 6. Afterwards, there will be drinks at O’Toole’s. Costumes are a must. Did I forget a pumpkin beer you enjoy? Write to complain: beer.snob@yahoo.com. You can also “like” Beer Snob on Facebook or follow him on Twitter: @BeerSnobCT. This entry was posted in Beer Snob and tagged Dogfish Head Brewing, Long Trail Brewing, pumpkin, Saranac Brewing, Smuttynose Brewing, Southern Tier Brewing, Weyerbacher Brewing, Wolaver's Brewing. Bookmark the permalink.